My current makeup subscription box is from Ipsy. I was a bit skeptical about a monthly beauty and makeup subscription box because I didn't want to end up with a bunch of products I couldn't use or didn't know how to use. Each month you get full size or deluxe-sized products in a cute makeup bag, and I was sold after checking out their previous bags. If you're not very adventurous with makeup like me, it's a great way to build your makeup collection on the cheap and expand your makeup expertise! The January Ipsy Glam Bag theme was Metropolis. I got a super trendy silver and powder blue bag. I really liked this month's minimalistic design and I could see myself actually using this bag as a clutch. LOOOVE! At first I was really underwhelmed with this selection. I already have so many nail polishes, blush and lip glosses just from Ipsy alone and I was really hoping for something I haven't tried before. 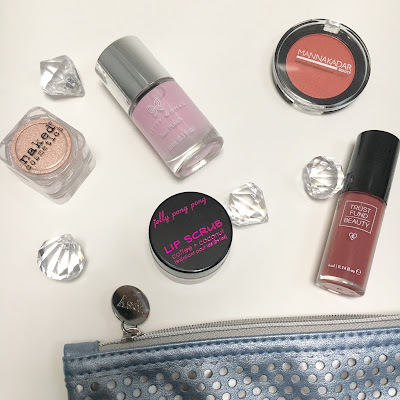 I rate the January Ipsy Glam Bag a 3/5! I was most excited to discover Manna Kadar beauty, a brand I've never heard of before. Naked Cosmetics Mica Pigment- I'm not the biggest fan of loose pigments and have stayed away from using them because they're just too messy. I'm not a seasoned makeup artist so I don't care for learning the tricks of the trade when it comes to using products like this. I am however, so stoked to use this product in different ways, other than on the eyelids. You can use loose pigments in glosses, moisturizers and nail polishes...OOOHHH YEAH!!! Pretty Woman nail polish in I'm Not A Ballerina- Ipsy knows me well. Too well, in fact, since I've gotten so many pink nail polishes from them this past year. Maybe I should start hitting "No I don't like" on that little survey so I can get different stuff teeheee!!! Manna Kadar Paradise blush- I'm so happy to have this lovely little blush. I have tried so many different brands and I was surprised to see how pigmented this blush is. It's got the perfect golden shimmer and I love how the gold peeks through the deep pink when you move. It can honestly double as a highlight if you're looking for a subtle glow! What did you get in your January Glam Bag? I'd love to hear from you!